Look what I got in the mail today from my good blogging friend Susan Liles (susiestampalot)!!! Isn't it just beautiful?! I couldn't get the envelope open fast enough to take a peak at what was inside!! Susan this card is gorgeous and the words inside were much appreciated! Thank You, Thank You, Thank You! I want to come stamp with you and Jen *insert smiley face here* - I am just about 2 hours away!!!! Big Hugz! Very elegant ...Love the layout and colors...........LUCKY YOU !!!!! Awesome card! 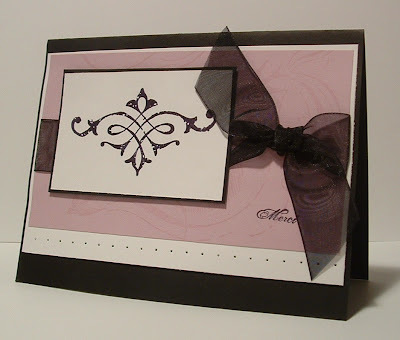 Love the pink and black (of course) and I love the thick sheer ribbon! I need to get some of that!